Narcissistic parents who appear to be great parents are the worst of all. These toxic parents are the ones who you would never suspect. They could be active members of the PTA. They may be regular church goers, the beloved community leaders or the ones who regularly donate to charities. On the outside, they appear to be wonderful doting parents with perfect lives. The pillars of society. But in the privacy of their own homes, they’re bullies. They are tyrannical. They run their homes with all the love of an incubator, and their children are mere ornaments. Often times narcissistic parents assign their children specific roles within the family. These roles are decided long before the child can even comprehend what is going on. The two most common roles are that of the scapegoat and the golden child. These roles serve two main functions. The first is to maintain the toxic homeostasis within the family system. When these roles are rigidly enforced, there is less likelihood the narcissistic parent’s control and agenda will be challenged or their false persona exposed. The second function these contrary roles play is to maintain the illusion of health and normalcy to outsiders by dumping and blaming all of the family’s problems onto the scapegoat. The golden child can do no wrong in the eyes of the narcissistic parent. This child is the narcissistic parent’s mirror. The flawless reflection. The golden child is idealized and placed on a pedestal by the narcissistic parent. The child is deemed perfect. The child’s achievements are exaggerated. The child’s talents are embellished. The child’s appearance is overstated, and so on. Through having a perfect child, the narcissistic parent becomes perfect by way of heredity. Then there is the role of the scapegoat. This child can do no right in the eyes of the narcissistic parent. This child is the narcissistic parent’s, and usually the entire family’s punching bag. This child serves as a receptacle. Holding the responsibility of the family’s burdens and problems, relieving them of all accountability. The family scapegoats bear the weight of all the inaccurate accusations, projections, and blame in the family. This role is strictly enforced by narcissistic parents and if the scapegoat tries to deviate or protest, he/she will be subjected to more abuse and cruelty. 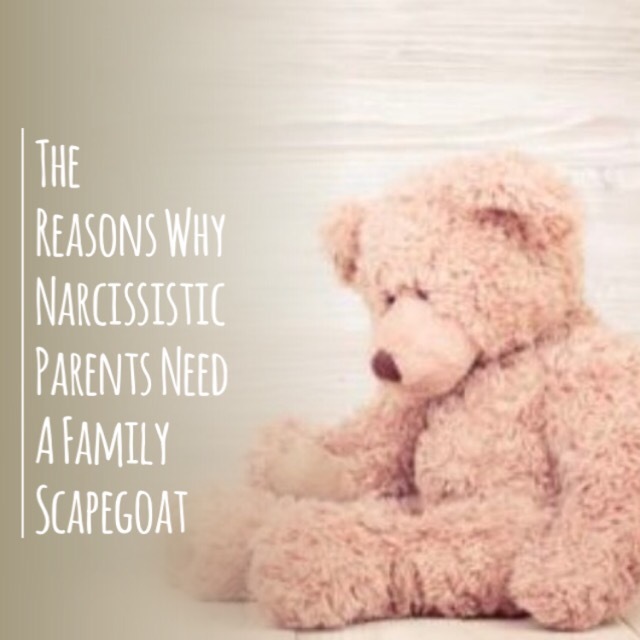 Narcissistic parents often pit the golden child and the scapegoat against each other either overtly or covertly through displays of extreme favoritism. The narcissistic parent may even manipulate their children to inflict abuse upon the scapegoat by proxy. This is another way the narcissistic parent escapes accountability for his/her actions and can appear innocent. The following is an excerpt from my book, I Am Free. It’s an insightful peek into the life and pain of growing up as the family scapegoat. The story is titled Who Does She Belong To? Written by Laura McCall. WHO DOES SHE BELONG TO? My mother gave birth to four children. Her first child was stillborn. Her next two children were live births, and they were well loved. Mama’s final birth was also a live birth. This baby was wanted and was needed, but not for the reasons most mothers have a baby. This child was planned, just like the previous three. Mama’s life was hers, and everything was always completed on her schedule. Even pregnancies. The pregnancy was wanted, because after the first three babies, Daddy decided that he’d had enough of Mama, so he left. No one was allowed to leave Mama! So, she followed him to Atlanta, Georgia, to talk him into coming home. That very weekend, she got pregnant. In essence, this baby was a tool. A game piece. Daddy wouldn’t leave Mama if she were pregnant. Mama knew that. Her fourth baby was a trap that Mama needed to get Daddy to come home. This fourth baby was me. I wasn’t pretty like Mama’s other babies. They were beautiful, eight-pound cherubs with sparkly eyes and round cheeks. I weighed six pounds and wasn’t healthy. In fact, I had such bad asthma that the doctor told Mama to have me baptized because I probably wouldn’t live very long. I have possibly three good memories of my childhood that are directly relative to my life. I have many beautiful memories that center around the events of my sister’s life: her beauty pageants, her boyfriends, her proms, her dates, her wedding, her pregnancies. The memories even include her clothes and the music she listened to. My brother had his own life. My memories of him are few, but for a while, he, too, was a Golden Child, like my sister. However, like me, he wasn’t liked by Daddy, so he left home at a young age. Before he went, Mama showered him with love and gifts. Even after he’d left, I repeatedly heard how wonderful he was and how he could do no wrong. I don’t remember gifts being given to me as a child. I do remember hearing that my birthday was too close to Income Tax Day and that there was no money. At least that’s what Mama always said. Mama said lots of things. She told many stories and always had a captive audience. I’m not sure when I heard Mama’s favorite story the first time, but I can tell you that she still tells it now, even as she is saddled with dementia. She still tells it with ease, and her description is painfully true. As she always had, Mama will tell the story to anyone who will listen, even if they’ve heard it before. Everyone always listened to see what she would say next! All eyes were on Mama as she finished the story. As she concludes her story, the tone in her voice changes. She will turn to me and pause as they wait to hear what the stranger said about me. Inevitably, Mama’s audience also turns their eyes toward me, the child with long stringy hair, usually in braided pigtails, that I had done myself, with one braid longer than the other. My bangs looked like they had been cut with hedge clippers. I was straight up and down skinny, and I was always told that my knees were the biggest part of my body. And I had a space between my front teeth that was large enough to drive a semi-truck through. There was nothing pretty about me, especially when I was being compared to the others. “Who does SHE belong to?” Mama’s question would be raised as she pointed to me. I can still hear the laughter of Mama and the shame ringing in my ears. Mama’s laughter cued her audience that they were to laugh as well. And they nearly always did. I heard that story so many times that it’s hard to figure out when I first began to notice a pattern. In the story, I was actually on one side, and my siblings were on the other. Mama would describe my brother and sister and point to one side of the room. When she got to me, the punch line, she actually pointed to the other side of the room. Even in her story, I was separated from my family. That’s how my entire life has felt. I was never truly part of Mama’s family, and she taught my brother and sister that this was acceptable. As children tend to do, they followed Mama’s example, and anytime they deemed that I didn’t fit in, for any reason, I was removed from the picture. I may be a character in the stories of their lives, but I am absent in many chapters. Despite the neglect that I suffered, actually, likely because of the neglect that I suffered, I was always anxious to prove myself as a faithful and loving daughter. I’m certain that I believed that after an act of devotedness, Mama would somehow see how valuable I was and shower me with the love and affection that I yearned for. Take for instance the time Mama needed her gallbladder removed. I was the one that drove her to the emergency room. I stayed with her while they diagnosed her and then performed surgery. I stayed the night with her, and the following day, and the following four days, because I knew better than to suggest that I needed to leave. I had a child and a husband, but I knew that if I left, I would face the wrath of Mama. Finally, on the fourth day, I said that I needed to run to my house because I had to pay a bill. On the way back to the hospital, I got a flat tire. There were no cell phones then. By the time I walked to a place with a phone, had my husband come change the tire, paid the bill and went back to the hospital, I was in trouble. “In trouble.” I was 31 years old, and yet I was “in trouble.” Mama told me when I got to the hospital that I obviously didn’t want to help her, so I should leave. Despite explaining what had happened and the fact that I’d been by her side nonstop for four days, she called me a liar and told me to leave. I should have been happy that I could go home to my family, but I felt as though I’d been punched in the gut. That time, Mama didn’t speak to me for about three weeks. I also recall one of the many times that Mama and Daddy moved into my home that I shared with my family. Mama never could manage money, so she moved in with us during her low points. Of course, she always told everyone that she was moving in with us because we were having financial issues and needed her help. In reality, she didn’t even contribute to the power bill. I finally got the strength to tell Mama that I had a larger bed in the barn. I told her that I knew she couldn’t physically move it into the house, so I offered to bring it in. I also told her that she could go to the furniture store, buy a bed, and they would deliver it. Simple, right? Mama got into her car and drove away. No one heard from her for weeks. Finally, I was told that she had rented an apartment with my niece and her boyfriend. But what about Daddy, you wonder? Mama left him at my house for over a year and kept his paycheck. She gave him $100.00 a month to live on. Daddy got very sick and decided to give my husband and myself power of attorney. When he told Mama, she had him moved into the laundry room of her apartment within 24 hours. All of that over a bed . . . Or so it seemed. That time, Mama didn’t speak to me for almost fourteen years. Now, Mama has dementia. For some reason, this has been a sort of release for me. The damage that she did to me is still here. I fight it daily. But now Mama is pitiful and even if she tries to manipulate, her mind isn’t clear enough anymore to be good at it. About two months ago, she was in the hospital and was very ill. I walked in and she immediately began to beg for forgiveness. She told me that she knew she had been a horrible mother to me. She told me that she was sorry. I had never heard those words in my life. She also talked about how beautiful I am. I wondered if she’d had a stroke and it destroyed the “mean part” of her brain. Either way, I had prayed all of my life that Mama would be able to have peace in her mind. I knew that despite her apparent disregard for me, it must have been torture to be her, as she was constantly planning your next move and next story. She seemed to have found that peace when I visited her that day. As for me and my peace? I am so thankful that I possess compassion and forgiveness, for two reasons. Firstly, so that I know that I’m not like her. Secondly, so that I can forgive and move forward, despite bearing the scars of her emotional damage to me. My relationship with my family is akin to being hit by a bus. The damage has been done. Hating the bus or the driver won’t make me heal any faster. In fact, it just may slow me down. Who do I belong to? I belong to myself.